Students were offered an opportunity to see their professors demonstrate talent outside of the classroom. The Fine and Performing Arts Center Recital Hall opened its doors Friday, Sept. 15, to showcase the semester’s first concert. The International Chamber Music Concert, mainly composed of TAMIU music instructors, gave a free, and open to the public, 90-minute performance. Assistant Professor James Moyer, band director and interim chair of the Fine and Performing Arts Department, talked about improvised entrances toward the end of the show. 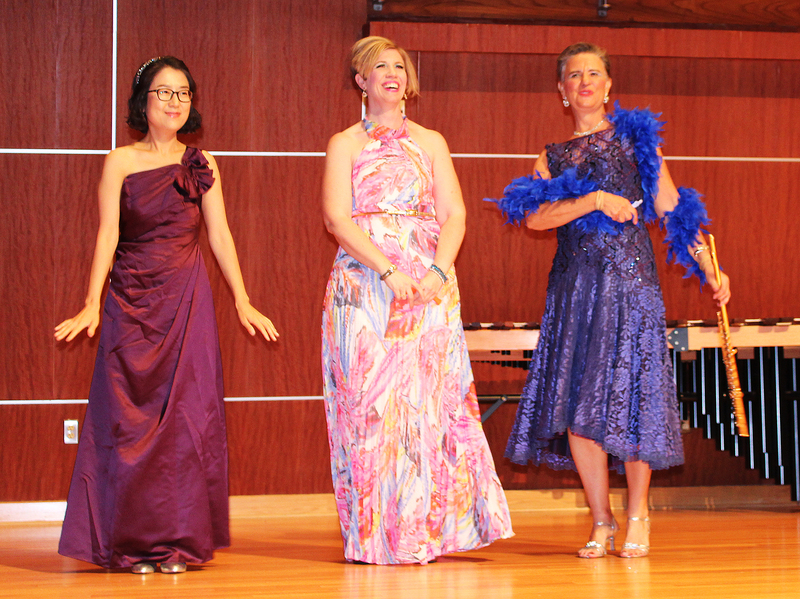 From left, Associate Professor Yu-Mei Huang, pianist, Instructor Dana Crabtree, singer, and Associate Professor Susan Berdaul, flutist, finish taking a bow during the International Chamber Music Concert Friday night, Sept. 15, 2017, in the Fine and Performing Arts Building. 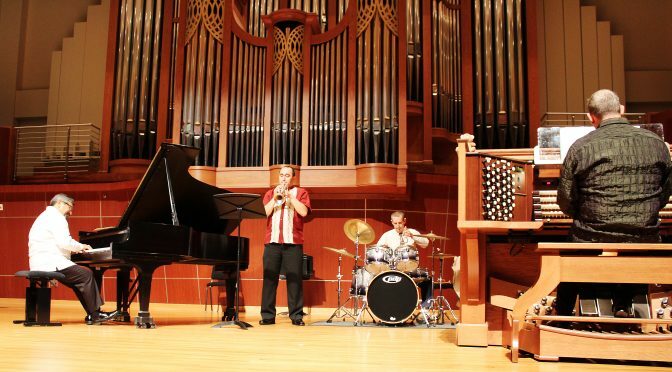 Musicians, from left, Senior Lecturer Jerry Quintero, and Assistant Professors Oswaldo Zapata, James Moyer and Colin Campbell perform during the International Chamber Music Concert Friday night, Sept. 15, 2017, in the Fine and Performing Arts Building. “We wanted to keep a club kind of atmosphere, so it really balances out the classical part of the program,” Moyer said. He voiced concern over the missing bass player, saying he was worried they “would be a little off” without that band member, but was thankful they were able to substitute with the organ and give a memorable final performance. The concert featured a variety of musical genres, including a piece sang by Dana Crabtree, vocal instructor, in the 817-seat auditorium. Associate Professor Yu-Mei Huang has been organizing this event for a few years now and the performances are constantly changing. As new faces arrive, styles change. The Fine and Performing Arts Department will bring the students new shows throughout the year. October will feature a few shows, but November offers a number of events, including a theatrical play directed by Assistant Professional Gilberto Martinez Jr., dance and music recitals, as well as a few professional musicians. Interested persons may check the events calendar for further details.